The Low-Density Lipoprotein (LDL) Receptor (LDL-R) is a mosaic protein of 839 amino acids (after removal of 21-amino acid signal peptide) that mediates the endocytosis of cholesterol-rich LDL. It is a cell-surface receptor that recognizes the apoprotein B100, which is embedded in the outer phospholipid layer of LDL particles. The receptor also recognizes the apoE protein found in chylomicron remnants and VLDL remnants (IDL). In humans, the LDL receptor protein is encoded by the LDLR gene on chromosome 19. It belongs to the Low density lipoprotein receptor gene family. It is most significantly expressed in bronchial epithelial cells and adrenal gland and cortex tissue. Michael S. Brown and Joseph L. Goldstein were awarded the 1985 Nobel Prize in Physiology or Medicine for their identification of LDL-R and its relation to cholesterol metabolism and familial hypercholesterolemia. The LDLR gene also contains one of 27 SNPs associated with increased risk of coronary artery disease. The LDLR gene resides on chromosome 19 at the band 19p13.2 and is split into 18 exons. Exon 1 contains a signal sequence that localises the receptor to the endoplasmic reticulum for transport to the cell surface. Beyond this, exons 2-6 code the ligand binding region; 7-14 code the epidermal growth factor (EGF) domain; 15 codes the oligosaccharide rich region; 16 (and some of 17) code the membrane spanning region; and 18 (with the rest of 17) code the cytosolic domain. This gene produces 6 isoforms through alternative splicing. This protein belongs to the LDLR family and is made up of a number of functionally distinct domains, including 3 EGF-like domains, 7 LDL-R class A domains, and 6 LDL-R class B repeats. 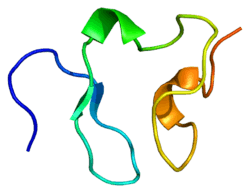 Next to the ligand binding domain is an EGF precursor homology domain (EGFP domain). This shows approximately 30% homology with the EGF precursor gene. There are three "growth factor" repeats; A, B and C. A and B are closely linked while C is separated by the YWTD repeat region, which adopts a beta-propeller conformation (LDL-R class B domain). It is thought that this region is responsible for the pH-dependent conformational shift that causes bound LDL to be released in the endosome. Mutations in the gene encoding the LDL receptor are known to cause familial hypercholesterolaemia. LDL receptor mediates the endocytosis of cholesterol-rich LDL and thus maintains the plasma level of LDL. This occurs in all nucleated cells, but mainly in the liver which removes ~70% of LDL from the circulation. LDL receptors are clustered in clathrin-coated pits, and coated pits pinch off from the surface to form coated endocytic vesicles that carry LDL into the cell. After internalization, the receptors dissociate from their ligands when they are exposed to lower pH in endosomes. After dissociation, the receptor folds back on itself to obtain a closed conformation and recycles to the cell surface. The rapid recycling of LDL receptors provides an efficient mechanism for delivery of cholesterol to cells. It was also reported that by association with lipoprotein in the blood, viruses such as hepatitis C virus, Flaviviridae viruses and bovine viral diarrheal virus could enter cells indirectly via LDLR-mediated endocytosis. In addition, LDLR modulation is associated with early atherosclerosis-related lymphatic dysfunction. Synthesis of receptors in the cell is regulated by the level of free intracellular cholesterol; if it is in excess for the needs of the cell then the transcription of the receptor gene will be inhibited. LDL receptors are translated by ribosomes on the endoplasmic reticulum and are modified by the Golgi apparatus before travelling in vesicles to the cell surface. In humans, LDL is directly involved in the development of atherosclerosis,which is the process responsible for the majority of cardiovascular diseases, due to accumulation of LDL-cholesterol in the blood. Hyperthyroidism may be associated with hypocholesterolaemia via upregulation of the LDL receptor, and hypothyroidism with the converse. A vast number of studies have described the relevance of LDL receptors in the pathophysiology of atherosclerosis, metabolomics syndrome, and steatohepatitis Previously, rare mutations in LDL-genes have been shown to contribute to myocardial infarction risk in individual families, whereas common variants at more than 45 loci have been associated with myocardial infarction risk in the population. When compared with non-carriers, LDLR mutation carriers had higher plasma LDL cholesterol, whereas APOA5 mutation carriers had higher plasma triglycerides. Recent evidence has connected MI risk with coding-sequence mutations at two genes functionally related to APOA5, namely lipoprotein lipase and apolipoprotein C-III. Combined, these observations suggest that, as well as LDL cholesterol, disordered metabolism of triglyceride-rich lipoproteins contributes to MI risk. Overall, LDLR has a high clinical relevance in blood lipids. Hyperthyroidism may be associated with hypocholesterolaemia via upregulation of the LDL receptor, and hypothyroidism with the converse. A multi-locus genetic risk score study based on a combination of 27 loci, including the LDLR gene, identified individuals at increased risk for both incident and recurrent coronary artery disease events, as well as an enhanced clinical benefit from statin therapy. The study was based on a community cohort study (the Malmo Diet and Cancer study) and four additional randomized controlled trials of primary prevention cohorts (JUPITER and ASCOT) and secondary prevention cohorts (CARE and PROVE IT-TIMI 22). 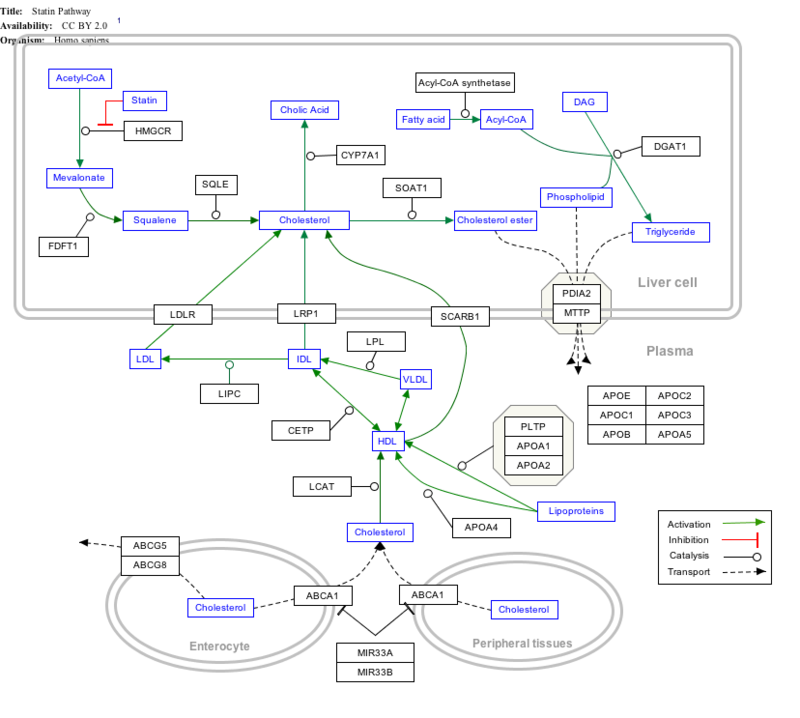 ↑ "Diseases that are genetically associated with LDLR view/edit references on wikidata". ↑ Südhof TC, Goldstein JL, Brown MS, Russell DW (May 1985). "The LDL receptor gene: a mosaic of exons shared with different proteins". Science. 228 (4701): 815–22. doi:10.1126/science.2988123. PMID 2988123. ↑ Francke U, Brown MS, Goldstein JL (May 1984). "Assignment of the human gene for the low density lipoprotein receptor to chromosome 19: synteny of a receptor, a ligand, and a genetic disease". Proceedings of the National Academy of Sciences of the United States of America. 81 (9): 2826–30. doi:10.1073/pnas.81.9.2826. PMC 345163 . PMID 6326146. ↑ Lindgren V, Luskey KL, Russell DW, Francke U (December 1985). "Human genes involved in cholesterol metabolism: chromosomal mapping of the loci for the low density lipoprotein receptor and 3-hydroxy-3-methylglutaryl-coenzyme A reductase with cDNA probes". Proceedings of the National Academy of Sciences of the United States of America. 82 (24): 8567–71. doi:10.1073/pnas.82.24.8567. PMC 390958 . PMID 3866240. 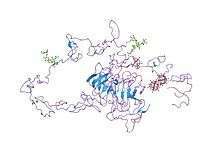 1 2 "LDLR low density lipoprotein receptor [Homo sapiens (human)] - Gene - NCBI". www.ncbi.nlm.nih.gov. Retrieved 2016-10-10. ↑ Nykjaer A, Willnow TE (June 2002). "The low-density lipoprotein receptor gene family: a cellular Swiss army knife?". Trends in Cell Biology. 12 (6): 273–80. doi:10.1016/S0962-8924(02)02282-1. PMID 12074887. ↑ "BioGPS - your Gene Portal System". biogps.org. Retrieved 2016-10-10. ↑ "The Nobel Prize in Physiology or Medicine 1985" (Press release). The Royal Swedish Academy of Science. 1985. Retrieved 2010-07-01. ↑ Brown MS, Goldstein JL (November 1984). "How LDL receptors influence cholesterol and atherosclerosis". Scientific American. 251 (5): 58–66. doi:10.1038/scientificamerican0984-52. PMID 6390676. 1 2 "LDLR - Low-density lipoprotein receptor precursor - Homo sapiens (Human) - LDLR gene & protein". www.uniprot.org. Retrieved 2016-10-10. ↑ Yamamoto T, Davis CG, Brown MS, Schneider WJ, Casey ML, Goldstein JL, Russell DW (November 1984). 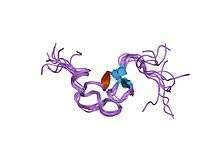 "The human LDL receptor: a cysteine-rich protein with multiple Alu sequences in its mRNA". Cell. 39 (1): 27–38. doi:10.1016/0092-8674(84)90188-0. PMID 6091915. ↑ Brown MS, Herz J, Goldstein JL (August 1997). "LDL-receptor structure. Calcium cages, acid baths and recycling receptors". Nature. 388 (6643): 629–30. doi:10.1038/41672. PMID 9262394. ↑ Gent J, Braakman I (October 2004). "Low-density lipoprotein receptor structure and folding". Cellular and Molecular Life Sciences. 61 (19-20): 2461–70. doi:10.1007/s00018-004-4090-3. PMID 15526154. ↑ Leren TP (November 2014). "Sorting an LDL receptor with bound PCSK9 to intracellular degradation". Atherosclerosis. 237 (1): 76–81. doi:10.1016/j.atherosclerosis.2014.08.038. PMID 25222343. ↑ Goldstein JL, Brown MS (April 2009). "The LDL receptor". Arteriosclerosis, Thrombosis, and Vascular Biology. 29 (4): 431–8. doi:10.1161/ATVBAHA.108.179564. PMID 19299327. ↑ Rudenko G, Henry L, Henderson K, Ichtchenko K, Brown MS, Goldstein JL, Deisenhofer J (December 2002). "Structure of the LDL receptor extracellular domain at endosomal pH". Science. 298 (5602): 2353–8. doi:10.1126/science.1078124. PMID 12459547. ↑ Basu SK, Goldstein JL, Anderson RG, Brown MS (May 1981). "Monensin interrupts the recycling of low density lipoprotein receptors in human fibroblasts". Cell. 24 (2): 493–502. PMID 6263497. ↑ Brown MS, Anderson RG, Goldstein JL (March 1983). "Recycling receptors: the round-trip itinerary of migrant membrane proteins". Cell. 32 (3): 663–7. PMID 6299572. ↑ Agnello V, Abel G, Elfahal M, Knight GB, Zhang QX (October 1999). "Hepatitis C virus and other flaviviridae viruses enter cells via low density lipoprotein receptor". Proceedings of the National Academy of Sciences of the United States of America. 96 (22): 12766–71. PMID 10535997. ↑ Milasan A, Dallaire F, Mayer G, Martel C (2016-01-01). "Effects of LDL Receptor Modulation on Lymphatic Function". Scientific Reports. 6: 27862. doi:10.1038/srep27862. PMID 27279328. ↑ Hsieh J, Koseki M, Molusky MM, Yakushiji E, Ichi I, Westerterp M, Iqbal J, Chan RB, Abramowicz S, Tascau L, Takiguchi S, Yamashita S, Welch CL, Di Paolo G, Hussain MM, Lefkowitch JH, Rader DJ, Tall AR (July 2016). "TTC39B deficiency stabilizes LXR reducing both atherosclerosis and steatohepatitis". Nature. 535 (7611): 303–7. doi:10.1038/nature18628. PMID 27383786. ↑ Walter K, Min JL, Huang J, Crooks L, Memari Y, McCarthy S, Perry JR, Xu C, Futema M, Lawson D, Iotchkova V, Schiffels S, Hendricks AE, Danecek P, Li R, Floyd J, Wain LV, Barroso I, Humphries SE, Hurles ME, Zeggini E, Barrett JC, Plagnol V, Richards JB, Greenwood CM, Timpson NJ, Durbin R, Soranzo N (October 2015). "The UK10K project identifies rare variants in health and disease". Nature. 526 (7571): 82–90. doi:10.1038/nature14962. PMID 26367797. ↑ Rose-Hellekant TA, Schroeder MD, Brockman JL, Zhdankin O, Bolstad R, Chen KS, Gould MN, Schuler LA, Sandgren EP (August 2007). "Estrogen receptor-positive mammary tumorigenesis in TGFalpha transgenic mice progresses with progesterone receptor loss". Oncogene. 26 (36): 5238–46. doi:10.1038/sj.onc.1210340. PMC 2587149 . PMID 17334393. ↑ Crosby J, Peloso GM, Auer PL, Crosslin DR, Stitziel NO, Lange LA, et al. (July 2014). "Loss-of-function mutations in APOC3, triglycerides, and coronary disease". The New England Journal of Medicine. 371 (1): 22–31. doi:10.1056/NEJMoa1307095. PMID 24941081. ↑ Jørgensen AB, Frikke-Schmidt R, Nordestgaard BG, Tybjærg-Hansen A (July 2014). "Loss-of-function mutations in APOC3 and risk of ischemic vascular disease". The New England Journal of Medicine. 371 (1): 32–41. doi:10.1056/NEJMoa1308027. PMID 24941082. ↑ Shuldiner AR, Pollin TI (August 2010). "Genomics: Variations in blood lipids". Nature. 466 (7307): 703–4. doi:10.1038/466703a. PMID 20686562. ↑ Teslovich TM, Musunuru K, Smith AV, Edmondson AC, Stylianou IM, Koseki M, et al. (August 2010). "Biological, clinical and population relevance of 95 loci for blood lipids". Nature. 466 (7307): 707–13. doi:10.1038/nature09270. PMID 20686565. Brown MS, Goldstein JL (July 1979). "Receptor-mediated endocytosis: insights from the lipoprotein receptor system". Proceedings of the National Academy of Sciences of the United States of America. 76 (7): 3330–7. doi:10.1073/pnas.76.7.3330. PMC 383819 . PMID 226968. Hobbs HH, Brown MS, Goldstein JL (1993). "Molecular genetics of the LDL receptor gene in familial hypercholesterolemia". Human Mutation. 1 (6): 445–66. doi:10.1002/humu.1380010602. PMID 1301956. Fogelman AM, Van Lenten BJ, Warden C, Haberland ME, Edwards PA (1989). "Macrophage lipoprotein receptors". Journal of Cell Science. Supplement. 9: 135–49. PMID 2855802. Barrett PH, Watts GF (March 2002). "Shifting the LDL-receptor paradigm in familial hypercholesterolemia: novel insights from recent kinetic studies of apolipoprotein B-100 metabolism". Atherosclerosis. Supplements. 2 (3): 1–4. doi:10.1016/S1567-5688(01)00012-5. PMID 11923121. May P, Bock HH, Herz J (April 2003). "Integration of endocytosis and signal transduction by lipoprotein receptors". Science's STKE. 2003 (176): PE12. doi:10.1126/stke.2003.176.pe12. PMID 12671190. Gent J, Braakman I (October 2004). "Low-density lipoprotein receptor structure and folding". Cellular and Molecular Life Sciences. 61 (19-20): 2461–70. doi:10.1007/s00018-004-4090-3. PMID 15526154.